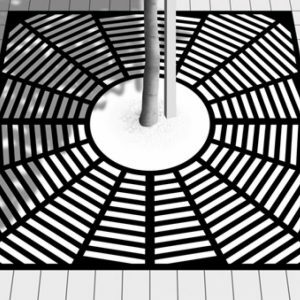 WindsorUrban Tree Protection grates help prevent soil erosion and allow irrigation while preventing tree damage from vehicle and pedestrian traffic, and compaction of the soil that prevents aeration to roots. Width: 910, 1000 & 1500mm. Central aperture diameter: 345, 380 & 550mm. Tree grid supplied in primer finish as standard. Can be supplied painted in RAL or BS colours, please enquire. 30 x 30mm galvanised angle iron sub frame available. Cast aluminium, primer finish as standard. A variety of cast aluminium designs and sizes are available to cater for a range of tastes and applications. The Tyne tree grid can be supplied with or without the inner ring. This can initially be used when the tree is a sapling and once the tree matures it may be removed to expand the aperture of the grid thus allowing more room for tree growth without the need to replace the grid. Optional sub-frame specifications: 935, 1025, or 1525mm sq. o/d. 30 x 30mm angle, 5mm typ. wall. Galvanised finish. Tree grid sections may be bolted together to prevent unauthorised removal. All tree grids can be supplied with a galvanised mild steel subframe.